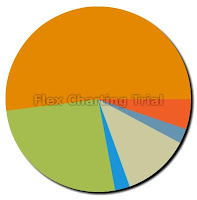 Charts compiled without a Flash Builder Pro license contain a watermark. Test automation tools (i.e. FlexMonkey) that interact with a SWF compiled without a Flash Builder Pro license will trigger a "License not present. With the trial version only limited records are allowed" error. To avoid these results, simply enter a valid Flash Builder Pro license into Flash Builder and compile your SWF using Flash Builder. Duh. Well, one way to ensure that a valid Flash Builder Pro license was compiled into your SWF is to simply check out your charts or your automation scripts. For charts, if there are no watermarks, you're good. For automation, if you don't get the "license not found" error, you're good. But, for automation, this can potentially get tedious. Thanks for sharing a story about the flash developing. It was informative and worthy reading.